MANILA -- Two years after President Rodrigo Duterte assumed office, the Philippines has witnessed the government enhanced its engagement with traditional and non-traditional partners. In an accomplishment report obtained by the Philippine News Agency, the agency noted that Manila continues to strengthen ties with traditional allies, particularly with the member states of the Association of Southeast Asian Nations (ASEAN), all while moving close with non-traditional partners such as Russia through a multitude of state and official visits. Numerous agreements were signed during these visits, notably with Japan and China on economic and infrastructure projects. These agreements feed into the “Build, Build, Build” program of the Duterte administration, which will provide the infrastructure and logistical support for the country’s economic development. Manila also inked 19 bilateral agreements with Moscow, including those on agriculture, trade, transportation, defense, security, and energy. Among others, business deals worth USD875 million were sealed and Russia donated military equipment to the Philippines. High-level engagements between the two states include President Duterte's trip to Moscow in 2017 and the visit of Russian Prime Minister Dmitry Medvedev, Foreign Minister Sergey Lavrov, and Defense Minister Sergey Shoygu to the Philippines. In May, Foreign Affairs Secretary Alan Peter Cayetano conducted follow-up talks with Lavrov in Russia. Meanwhile, Manila and Washington reaffirmed to bolster alliance anchored on their Mutual Defense Treaty. A delegation led by Executive Secretary Salvador Medialdea also had "productive discussions" on critical regional and international issues with then US Pacific Command (PACOM) chief Admiral Harry Harris Jr. in Honolulu in May this year. A month later, a team headed by National Security Adviser Hermogenes Esperon Jr. and Cayetano again visited the US. They met with their counterparts to reaffirm the two countries’ partnership and security alliance. On the South China Sea dispute, the government had underscored its "deliberate and nuanced diplomacy," which lowered tensions in the region and resulted in clear economic gains for the country. This, in terms of access to marine resources, protection of the marine ecology, and the potential to explore oil and gas resources. 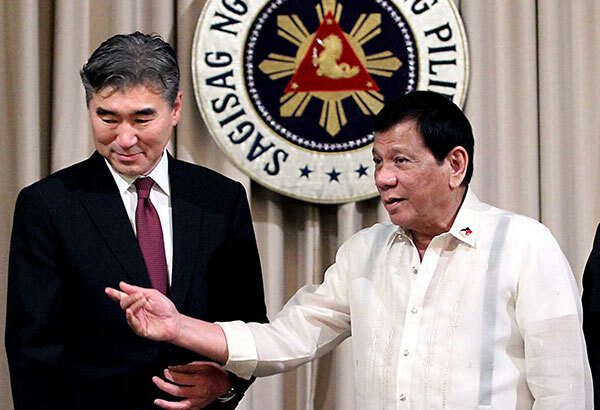 The country's improving relations with China also led to bilateral visits and cooperative mechanisms, which according to the DFA, brought about "an improved environment for managing issues in the West Philippine Sea." At the same time, the Duterte administration actively pursued the Philippines’ advocacy on the contested waters by pushing for the full and effective implementation of the Declaration on the Conduct of Parties in the South China Sea (DOC). DOC is a non-binding document that embodies the collective commitment of ASEAN and China to resolve peacefully the maritime row. Last year, the ASEAN regional bloc and China adopted the framework for the Code of Conduct in the South China Sea (COC) under the Philippines’ chairmanship. The adoption, regarded as a sign of progress, was signed more than a decade later since the 2002 DOC was approved.